Those considered to be at greatest risk of developing Type 2 diabetes across Nottinghamshire are set to benefit from increased help to avoid the disease. In August 2016, the Healthier You: Diabetes Prevention Programme will launch across the Nottingham North and East patch. 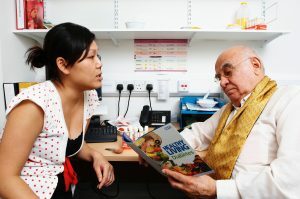 Type 2 diabetes is one of the UK’s biggest health challenges – there are currently 2.8 million adults with the disease in England, and around 200,000 new diagnoses are made every year. This exciting new programme will be delivered by Leicester Diabetes Centre, an internationally recognised centre of excellence in diabetes research, education and innovation, and Ingeus UK,a provider of health, employment, training and skills services. This new partnership is working jointly Clinical Commissioning Groups (CCGs), including Nottingham North and East CCG, and Local Authorities in Leicester, Leicestershire and Rutland, Nottinghamshire and Northamptonshire to provide comprehensive support and prevention services to more than 2,100 people in 2016-17 and 3,200 people in 2017-18 as a first wave site of the Healthier You: NHS Diabetes Prevention Programme. Nationally, the landmark prevention programme will, over the next five years, help up to 190,000 people across England who are at high risk of developing Type 2 diabetes. Dr Paramjit Panesar, Assistant Clinical Lead at Nottingham North and East Clinical Commissioning Group said: “We’re delighted to be involved with the Healthier You: NHS Diabetes Prevention Programme. Type 2 diabetes is one of the biggest health issues we’re facing but, while it’s a serious condition, it’s often preventable. Referrals into the service in Nottingham North and East will start on 22 August 2016. Those at risk will participate in a programme aimed at supporting and encouraging healthier lifestyles, with a focus on diet and physical activity. Evidence shows that the programme is effective in achieving sustained behaviour change and reducing the incidence of the disease. If you think you might be at risk of diabetes then talk to your GP.